from the post dramatic address syndrome series..
"greeting no. 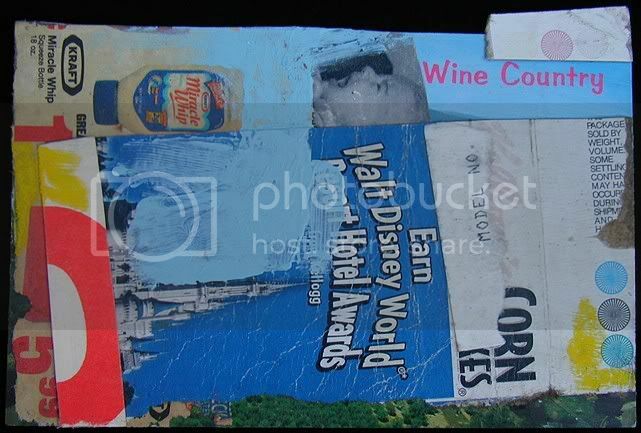 48," mixed media and found objects on california post card, 3.75"x5.5"
i've switched gears from new york and am now focusing on california found objects in this never ending series..
Hey, there's a photobooth-thingy in our mall here, but I'm assuming it's a digital one. It's not listed on the website you referenced. In fact, there are only two or three in MN listed there and I think one in WI. If it's anything you could use, let me know. I'm completely willing to drop a few bucks on a roll of film. There's the possibility my FIL may have a small tape recorder lying around (he's a pack rat to the point of actually having a problem, though I love him dearly,) but if he doesn't and you can use pics even if they are digital (I don't know how to know if they are or not b/c I'm dumb and it doesn't say anywhere on the machine!!) I would have to take you up on the you-loan-me-a-recorder idea. i'll email you after my walk..
WE WiLL make this work. i'm determined.